Cartoon diagram of a dimer of Escherichia coli galactose-1-phosphate uridylyltransferase (GALT) in complex with UDP-galactose (stick models). Potassium, zinc, and iron ions are visible as purple, gray, and bronze-colored spheres respectively. In biochemistry, a dimer is a macromolecular complex formed by two, usually non-covalently bound, macromolecules like proteins or nucleic acids. 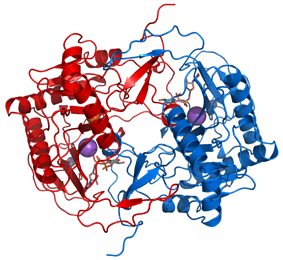 It is a quaternary structure of a protein. A homo-dimer would be formed by two identical molecules (a process called homodimerization). A hetero-dimer would be formed by two different macromolecules (called heterodimerization). Most dimers in biochemistry are not connected by covalent bonds. An example of a non-covalent heterodimer would be the enzyme reverse transcriptase, which is composed of two different amino acid chains. An exception is dimers that are linked by disulfide bridges such as the homodimeric protein NEMO. Some proteins contain specialized domains to ensure dimerization (dimerization domains). ^ Sluis-Cremer N, Hamamouch N, San Félix A, Velazquez S, Balzarini J, Camarasa MJ (August 2006). "Structure-activity relationships of [2',5'-bis-O-(tert-butyldimethylsilyl)-beta-D-ribofuranosyl]- 3'-spiro-5' '-(4' '-amino-1' ',2' '-oxathiole-2' ',2' '-dioxide)thymine derivatives as inhibitors of HIV-1 reverse transcriptase dimerization". J. Med. Chem. 49 (16): 4834–41. ^ Herscovitch M, Comb W, Ennis T, Coleman K, Yong S, Armstead B, Kalaitzidis D, Chandani S, Gilmore TD (February 2008). "Intermolecular disulfide bond formation in the NEMO dimer requires Cys54 and Cys347". Biochem. Biophys. Res. Commun. 367 (1): 103–8.